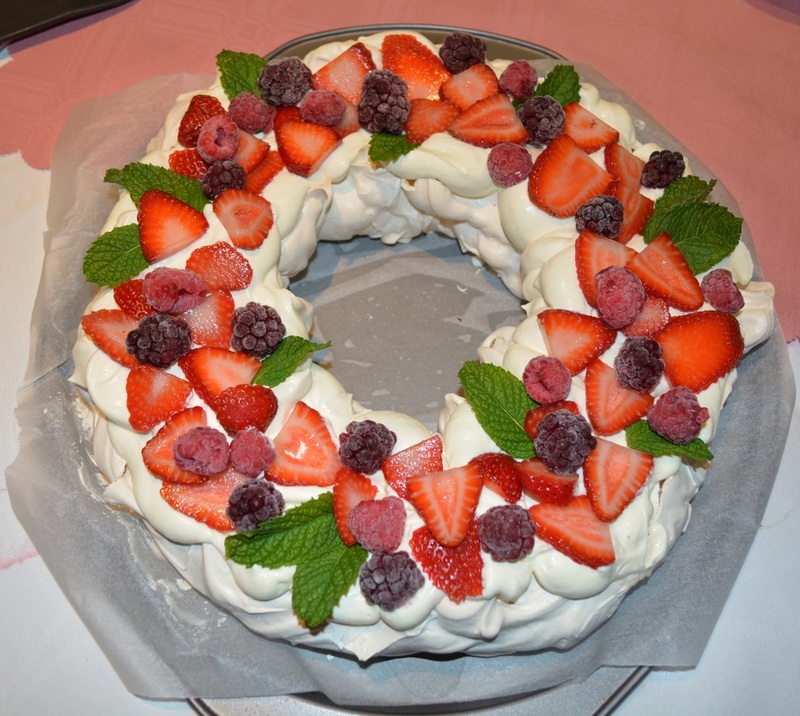 Last year I made the Pavlova Christmas Tree, this year I decided to make a Christmas Wreath. It was beautiful, when I brought it to the table my guests thought it looked amazing. And can I say it tastes as good as it looks. Once served it is gone very quickly. Now I decorated with a combination of fresh and frozen berries. Although I live in Australia and it is summer for Christmas and you can find fresh berries everywhere, I like the addition of frozen berries as I love the frosty colour they have, and I also love biting into a frozen berry. So I use fresh strawberries, but all the other berries are frozen. Take your time putting on the fruit, make it look pretty, it is so beautiful when done properly. And don't skip the mint leaves as they add such a beautiful colour and subtle flavour to the cream, even if you don't eat the actual leaf. Make ice cream, custard, lemon curd or Portuguese custard tarts with the egg yolks, I hate waste. This is really easy to make, I'll give you all the instructions you will need, make this dessert, it will not disappoint. Preheat your oven to 150C/140C fan forced. Now I used a pizza tray (which was the perfect size) lined with baking paper, but if you are using a normal baking tray, get a sheet of baking paper, then draw a circle 25cm in diameter. Line the baking tray with the baking paper, (put the traced side down, you don't want ink on your pavlova). I like to use a free standing mixer (but you can use a hand held one). Place the egg whites and salt in a large bowl of your mixer and beat until soft peaks appear. Slowly add in the sugar, a tablespoon at a time, beating well after each addition. After all the sugar has been added, just scrape down the side of the bowl once and beat until you have a mixture that is thick, glossy and all the sugar has dissolved. Fold in gently the cornflour and vinegar with a metal spoon. 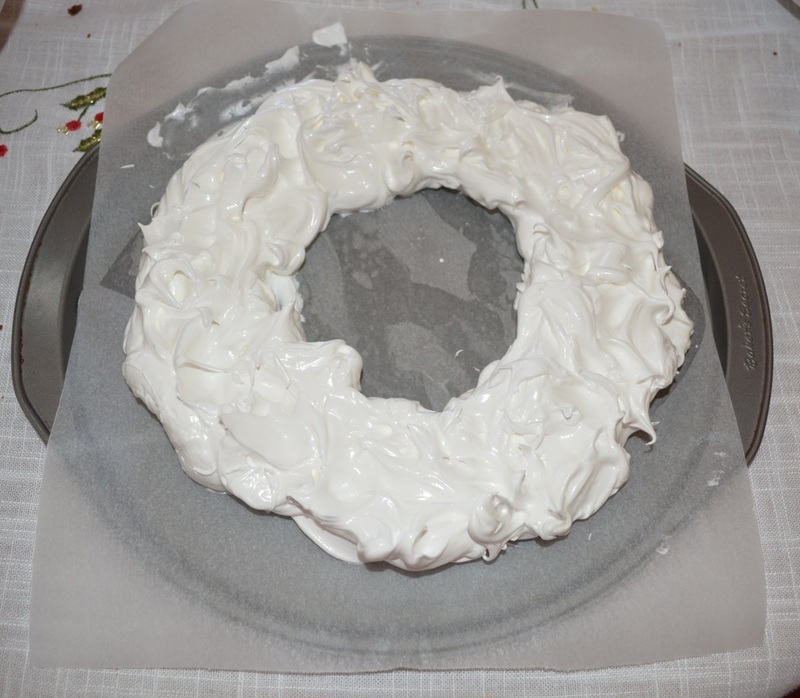 Place even sized dollops of the meringue along your traced circle, creating your wreath (if using a pizza pan, keep 2cm in from the edge of the pan). 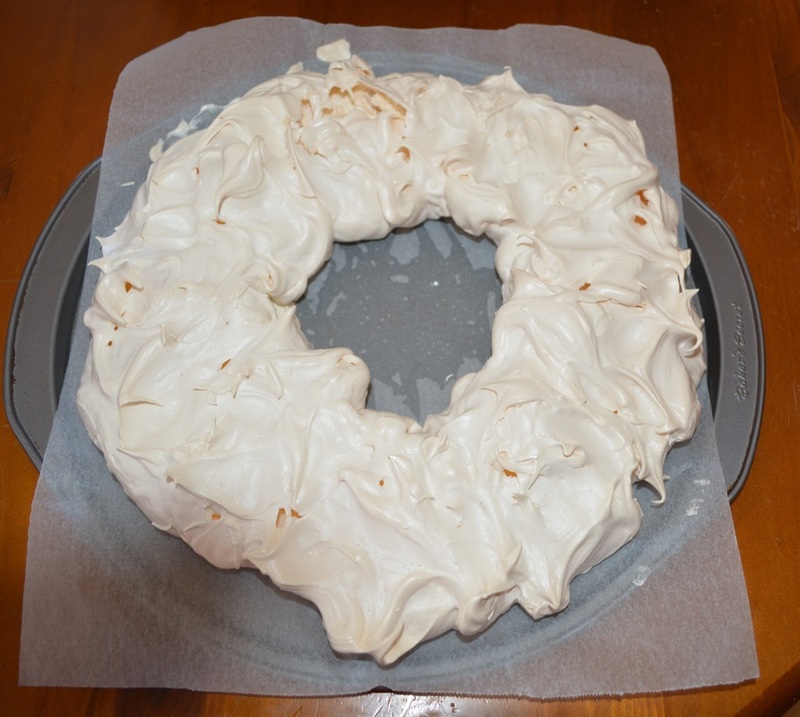 Using a spoon, swirl the meringue gently to fill in gaps between the dollops, and to make the wreath (roughly) even in width and height, it does not need to be perfect. Bake for 40 minutes in the centre of your oven, it will be a pale cream colour and look crisp on the outside. Reduce the oven temperature to 120C and bake a further 10 minutes. Turn off the oven, open the oven door slightly (you can place a wooden spoon in the opening to keep it open) and allow the pavlova to cool completely in the oven, it takes approximately 2 hours. The pavlova may crack a little, don't panic, it doesn't matter as the cracks get covered by the cream and berries. Just before serving, whip the cream until firm peaks, don't over whip or it will be like butter, you want it thick and creamy and luscious. Gently place the cream on the wreath. Position the mint leaves around the wreath. Slice the fresh strawberries into thin slices. Now I do add the berries on one at a time, treat this like a little piece of art. 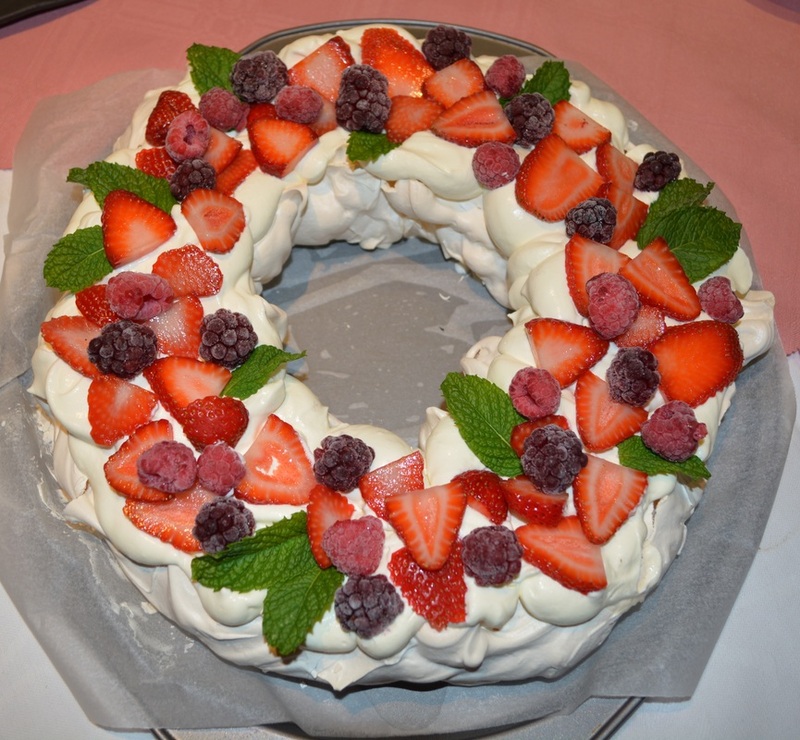 Start with the strawberries, position them around the wreath, then top with whatever other frozen berries you love.